Growing sunflowers is easy and inexpensive, but do you know how to harvest sunflower heads and seeds to feed the birds months after your harvest? A few simple steps can help you raise thousands of seeds that can last for months of free bird feeding. You've spent all summer watching your sunflowers grow to amazing heights crowned with stunning blooms, and those blooms are beginning to turn into heavy seed crops. But even though the seeds may have already formed, they are not necessarily ripe for harvesting right away, despite eager birds that may begin nibbling as soon as seeds appear. To make the most of your sunflower seed crop, it will be necessary to protect the seeds from sharp and hungry bills until they are ready to harvest. Covering seeds is the best way to keep birds from eating them prematurely, but the cover you choose must permit air circulation so the seeds can continue to ripen. A pantyhose stocking can be stretched over the sunflower heads, or similar cheesecloth, flour sacks, or netting can be wrapped around each flower head. Another option is to tie paper bags loosely over the blooms with twine, but avoid tying the bags so tightly that air cannot freely circulate around the bloom. You can also punch several small holes in the bags to ensure good airflow around the flower heads. Do not use plastic bags because they will condense moisture and cause rot on the seeds, making seeds less appealing and possibly even growing mold or fungus that can be dangerous to birds. If you have more space, you might consider positioning netting over the entire sunflower bed or patch, using hoops or stakes to hold a larger, broader cover. This netting will need to be fine enough to keep birds away from the plants, and it can be difficult to manage over a large patch or in areas with severe summer weather. The back of the flower heads will turn pale yellow, and the edges will begin to brown. The seeds themselves, which are white at first, will darken considerably. The soft ends of the buds on each seed will dry up and fall off, exposing the full seeds. Of course, if birds are giving your sunflowers even more attention than they give your feeders, it's a good bet that the sunflower seeds are ripe for harvesting. Harvesting seeds is as easy as cutting off the flower heads, leaving 2-4 inches of stalk on each one. Until you are ready to feed the birds, the heads should be stored in a dry area such as a shed or garage, in a secure container away from mice or other pests. The drier the flower heads are, the easier it will be to extract the seeds, whether you want to do it yourself or let the birds handle that task. Many birders struggle with the idea of prying out the hundreds or thousands of seeds from each flower head in order to feed the birds, but there really is no need. Birds' bills are ideally suited for extracting their own seeds. The easiest way to feed homegrown sunflower seeds to birds is to set out the whole, dried sunflower heads on a tray or platform feeder and let the birds enjoy it. You can also use the end of the stalk to poke through a fence or trellis to hang the sunflower heads for the birds to feed on. For the very largest, broadest sunflower heads, consider wrapping string or twine around them and hanging them, seed side up, for an impromptu hanging platform feeder. After birds have eaten all the seeds, you can sprinkle mixed birdseed on the empty sunflower head and the small seed pockets will hold the seed securely, allowing birds to continue using the natural feeder. If you want to loosen the seeds before putting flower heads out for the birds, rub your hand across the seeds in alternating circles (wearing heavy gloves will make this more comfortable). Some seeds may detach as you do this, and it is easy to save those seeds for replanting the next spring in a small, labeled envelope or jar stored in a cool, dry place. Seeds you replant, however, may not have the exact qualities of your first crop, depending on the crossbreeding of the original seeds and any cross-pollination that took place to produce your first flowers. With a bit of planning and some care while your sunflowers are ripening, you can easily harvest dozens of sunflower heads bulging with seeds that backyard birds will appreciate. Carefully saving the seeds can give you a rich supply of winter bird food, ideal for all types of visiting birds just when they need good nutrition the most. If you save just a few individual seeds for the following spring, you can be sure of another great harvest and an ongoing supply of nutritious, attractive, inexpensive food for your birds. Is White Proso Millet a Good Birdseed? 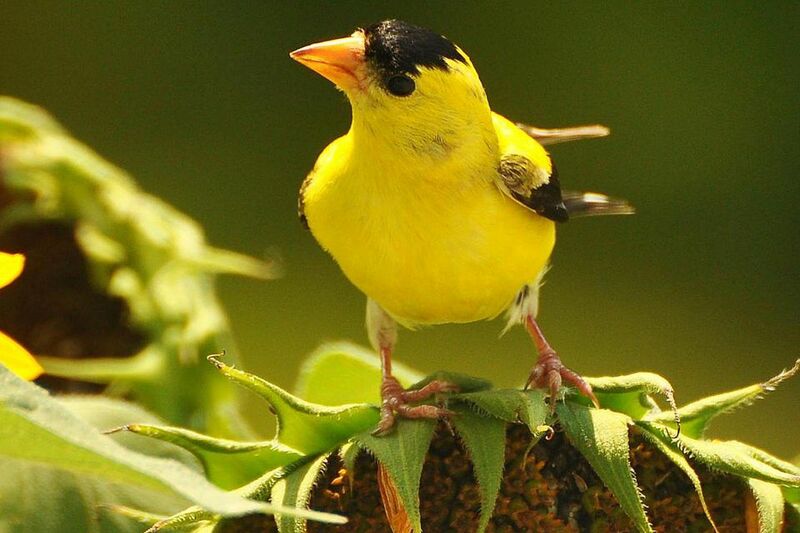 Do You Know the Best Birdseed for Your Backyard Birds? Go Nuts for Feeding Wild Birds Peanuts!